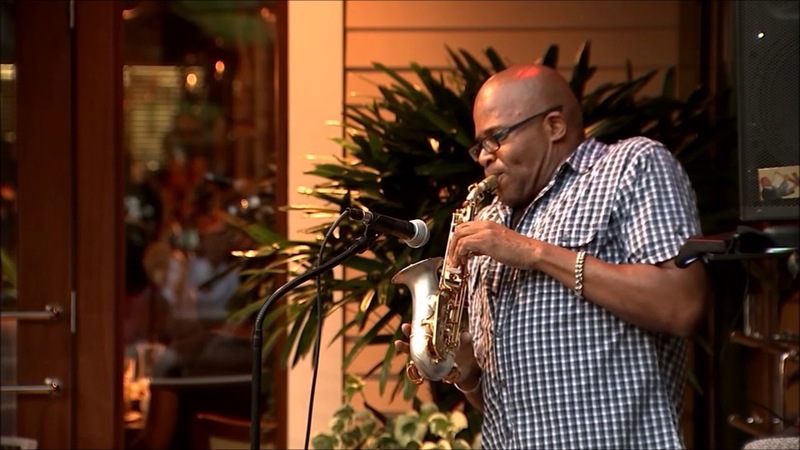 I am not just a Saxophonist, but am a "Performing" Contemporary Saxophonist, who is not limited to the stage. I am a showman and can be up close and personal with your audience. I currently perform with Permanent Vacation Band (Variety Band), Ocean Drive Party Band (Beach & Shag Variety Band), Beyond The Rhythm Band(R&B & Jazz Variety Band). I also does extensive solo work. I ALSO BOOK FULL BANDS!!! IF YOU HAVE AN EVENT I CAN PUT TOGETHER A BAND FOR YOU!!! David performed at our Holiday Party last night. He is extremely talented, has the latest equipment is very flexible and adapts his music to the crowd and occasion and knows how to set the tone and mood at a party. Everyone thoroughly enjoyed his performance last night. Also, he is very friendly and easy to work with. Highly recommend David for any event. He is outstanding and exceeded our expectations. David was absolutely superb for our Bash after Thanksgiving. He plays beautifully and you can definitely tell he loves what he does. He stepped up to the plate and help us set up for our event. He was quite versatile with his craft. I certainly would use him again. A heart felt thank you David you felt like family. We hope you felt the same. Thank you Vee, yes you all made me feel at home! Booked for a wedding reception. Everyone loved the performance. David was very professional and most of all an extremely talented performer. Beyond worth the money and would definitely book David again! Mr. Morrow exceeded our expectations. He was prompted on time. And he played an get selections of songs. He is truly a professional.. I will have him back again. He exceeded our expectations. David was absolutely amazing. He played during a romantic candle light dinner. He was professional, and is EXTREMELY talented. He made our event magical. Booked David on Gigsalad for my 50th birthday and I am telling you..... I could not have asked for a better saxophonist. First David came to the venue and set up from in the afternoon and just to add a little known fact about David that I noticed .... he has a sweet and kind spirit. I was setting up my dessert table and I was trying to open a bag of candy and the bag popped open and it was all over the floor. I got a broom from the venue and started to sweep and David came over to me and took the broom from me and said it is your birthday and you should not be sweeping no floor. I was so surprised and of course gave him the broom, lol. 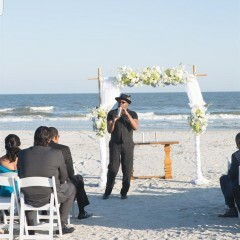 At the start of my event, he was on time and my guests loved his performance. David interact and engaged my guests in his performance by moving from table to table. All my guest are talking how great he was. One even said to me “ oh my goodness, that man used about four different sax instrument. I would definitely recommend and hire David for my future events! Thanks David for helping to make my birthday a success! What an amazing performance. David was professional, on time, accommodating, and incredibly talented. He catered to to audience and our students and staff were thrilled. We would definitely recommend him. Thank you Loreta, great kids & staff! David did a great job. Very polite on time outstanding performance. I would definitely hire him again. Thank you Sharon and I hope to hear from you again! David was the hit of our wedding and went above and beyond. He was able to play solo and freestyle along with the DJ. He did an amazing party and got the party going. HIGHLY recommend. My guests can't stop talking about the saxophone by the beach. So professional, so accommodating and soooooo good! We still can't believe the bargain that he was. Thank you for everything, David. We would choose you a hundred times over. Thank you Tiffany...I really appreciate the opportunity!!! Also, thank you for being so thorough in your preparation...I think you booked me almost a year in advanced!!! Beautiful, beautiful wedding! Everything plus more! David was outstanding! On time, professional, and his saxophone skill is impeccable. He played every song requested to perfection. It was definitely a night to remember. 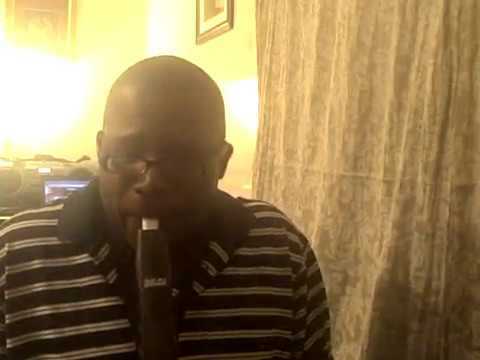 I definitely recommend him to anyone looking for a professional saxophone player. David was awesome - both to work with on booking the event and playing at it! His music really set the tone for our evening. I loved the way he wandered thru the crowd, playing jazz as we celebrated along the Savannah river. He arrived early, was very professional and entertained us in a way that exceeded my highest expectations! I highly recommend him to everyone! Thank you thank you thank you & pls call on me again!!! Awesome Performer!! 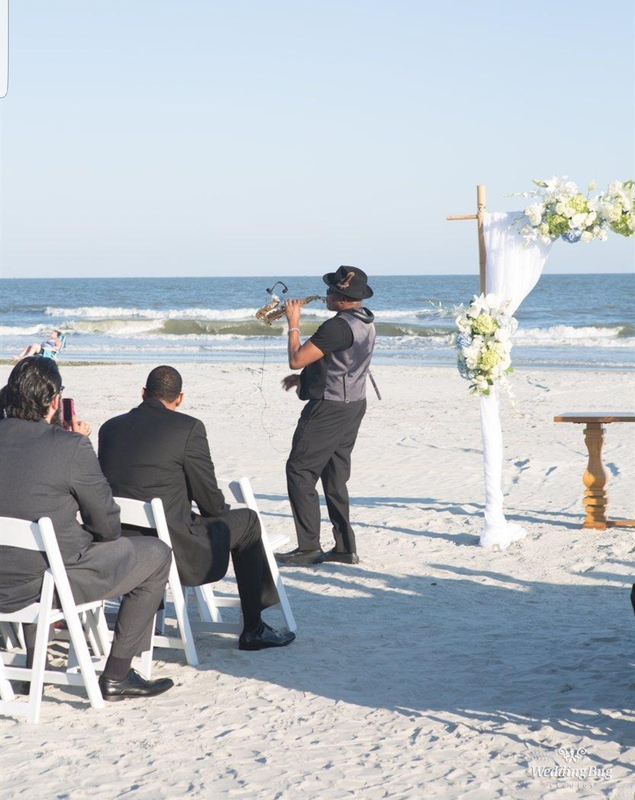 All my guest raved about how awesome he played this saxophone! 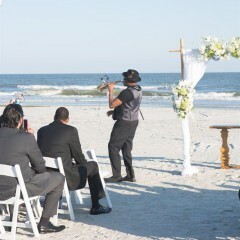 Everyone on the beach started recording him along with my wedding. He actually brought this venue to life with his beautiful talent! Will book again! Congrats & Thank you April! I hired David for my family reunion. I was absolutely pleased with his performance and level of professionalism. He pleased the crowd and everyone mentioned how great the performance was. I would definitely recommend him. Your Search is Over!!! 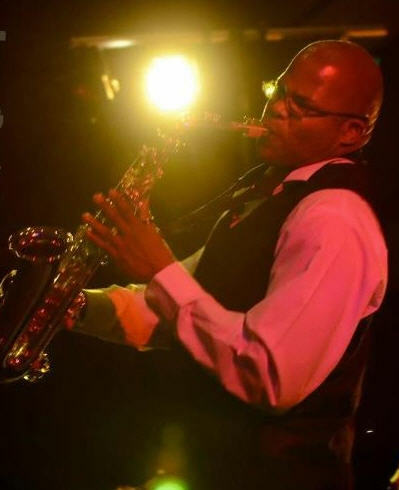 You have just found the best Saxophonist for your event!!! 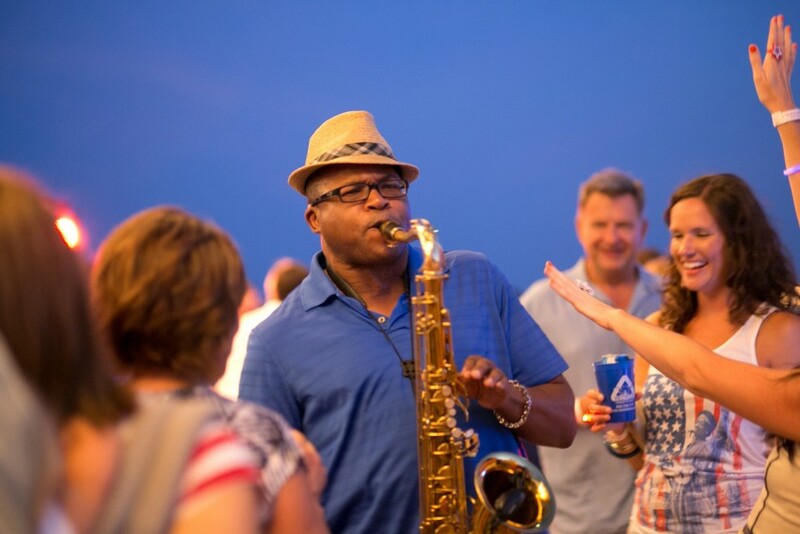 David is a "Performing" Saxophonist, who is not confined to the stage. 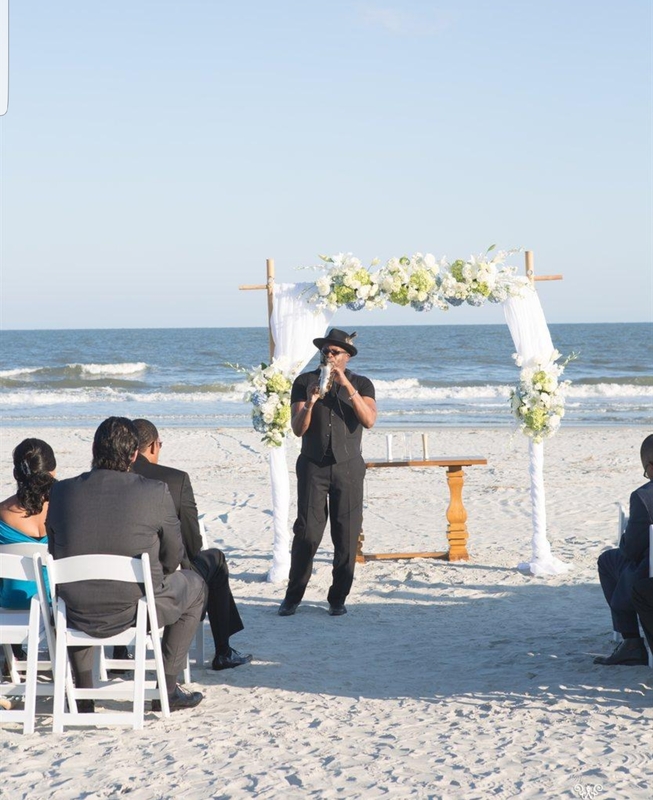 David is a showman who will dazzle you and your guests! David does extensive Solo work throughout the Southeast. David ‘s sound system includes wireless, Bluetooth, and iPad controlled technologies. He can also provide video and some lighting. David currently performs with Platinum Band Atlanta, South Bay Project Band, & Ross Brown Entertainment. David has also performed with Permanent Vacation Band (Rock, Shag, & Request), The First Class Band, Rich Hippey Band, Violinist Daniel D, Beyond The Rhythm Band (R&B, Jazz, & Variety), Carrie McDowell( Grammy award winning) Ann Caldwell, Liquid Pleasure Show Band, Tony Howard Show Band, Calvin Taylor, East Port Party Band, Ocean Drive Party Band (Beach, Shag, & Variety), Shades of Plenty, David Matthews Tribute Band, and was once a member of A Touch of Class Band (Legacy) , Sequence 8 and Secrets of Augusta, Ga, Fire of Statesboro, Ga, and many others.